Crack open that champagne, it's mimosa time! The morning after the bachelorette party is a great time to get your OJ cravings under control - with a nip of the hair of the dog. 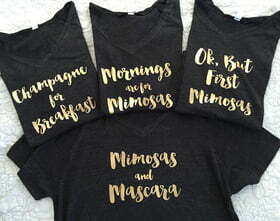 Champagne and Mimosa text options - Check our PHRASES page for more!